Cleaner Energy Drive at TfL? However, the Licence Lite project, led by the GLA, now appears the main action to try to source low carbon electricity for the tube – with the Mayor anticipating an announcement that the licence was to be granted in September (see para 2 of following GLA press release). 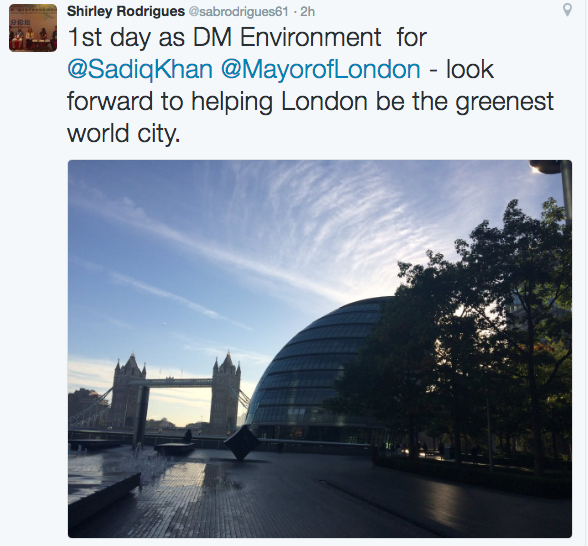 3 October 2016: The Mayor’s new Deputy for Environment, Shirley Rodrigues, whose appointment was announced by the Mayor in August, officially started work today. September 2016: TfL announced in December 2015 that one third of London’s buses were to run on waste fats and oils, with two bus operators, Stagecoach and Metroline, signing deals with Argent Energy to supply them with B20 green diesel. And, it’s just been announced that Argent Energy “has won two awards at the Low Carbon Vehicle Partnership (LowCVP) Low Carbon Champions Awards 2016: the Low Carbon Fuel Initiative of the Year Award and the highest accolade, the Grand Prix, or Winner of Winners, Award” – as reported in Biodiesel Magazine. The article sets out that “Argent only uses wastes for biodiesel and is the most sustainable producer in the U.K. The company has introduced high GHG-saving fuel into London in support of its challenging climate change targets. Argent captured the potential of biodiesel from waste as a drop-in replacement fuel without the need for vehicle modification. The fuel is priced around the same level as standard diesel, and sometimes cheaper. The GLA issued a research report in 2013 on the potential for on the opportunity for a biodiesel market in London using used cooking oil (UCOs), fats oils and grease (FOGs) from commercial and domestic sources in the capital – details of which can be read in an earlier post here. Details are also posted on the GLA website here – and a very brief update by the new Mayor was also provided in a recent MQ here. Further information on Hackney Council’s investments in fossil fuel companies is posted on Hackney Energy’s website and the Divest Hackney website has posted all the FoI responses received by the group from the council. Further events may come forward – check the main CEF website for further details. Energy for London will helping at an event on 8 September with Community Energy England, Repowering London and 10:10 – initiating work for the launch of a new hub for community energy groups in London – Community Energy London. If you’re working on a community energy project, exploring a potential opportunity, or simply want to find out more information on the community energy sector in London, do come along! 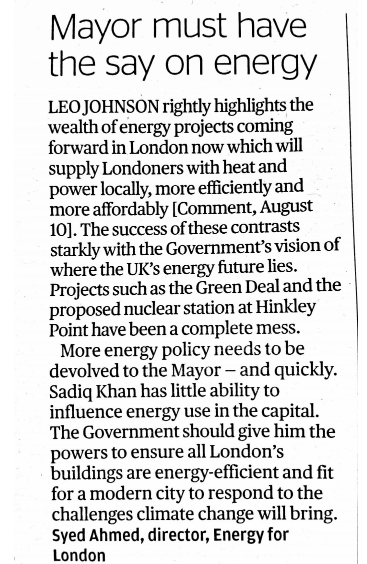 15 August 2016: Following a comment piece in the Evening Standard last week, on how London is supporting the growth of decentralised energy, here’s my letter in response which was published in the paper today. “These solar parks will allow Havering to become the first borough in London to generate renewable energy on a large scale to make money, which would be used to protect and improve frontline services. Energy produced in this way is clean, sustainable and renewable. A public consultation will be released by the council on the proposal sometime in the future. Havering councillors did however turn down an application in December 2014 for a solar farm in the borough. The developer went to appeal – but national government also refused the application earlier this year. The press release also mentions that “The proposed solar parks will also have a positive impact on local biodiversity for a range of plant and animal species, in particular broad leaved plants, grasses, wild flowers, butterflies, bees and birds. Part of the Council’s proposals would be to work with local beekeepers to promote healthy honeybee populations, as well as Britain’s rarer bumblebees, in and around the solar parks.” The National Solar Centre’s Biodiversity Guidance for Solar Developments provides further information on the ways in which solar projects can support local ecology.